$399 per month for a new 2014 Sprinter Cargo Van – Dave the #NVguy now at Garlyn Shelton Nissan in Temple Texas, is your Nissan Fleet and Commercial Sales Specialist. If you thought it would be too expensive to drive a Mercedes-Benz Sprinter van, well think again. 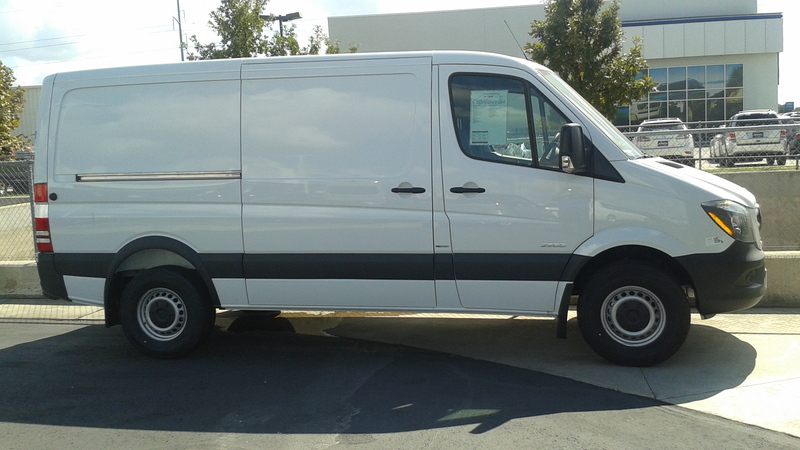 Drive this new 2014 Sprinter 2500 144″ wheelbase standard roof cargo van, for only $399 per month on a 36 month closed end FMV lease with Mercedes-Benz Finance, with approved credit. You can drive 60,000 miles in 3 years, 15 cents per mile over this. There is no security deposit, bank acquisition fee or any end of lease disposition fees. To reach this payment you will need to have either cash or trade of $3850 plus any applicable tax and license. The end of lease residual is $16,163, MSRP of this van is $38,485. You will pay $18,249 plus TT&L over the term of the lease. We can adjust the down payment or term to fit your needs, and we also have finance rates of 1.9% APR for 36 months or 2.9% APR for 48 or 60 months. This is just one example of the special offers from the Sprinter Guy this June 2015. Call me at 512-930-6158 or email dave@sprinterguy.com for more details or to see what other vans we have in inventory. What can a Sprinter Van do for your Business? Is this what you might do with your Sprinter van?